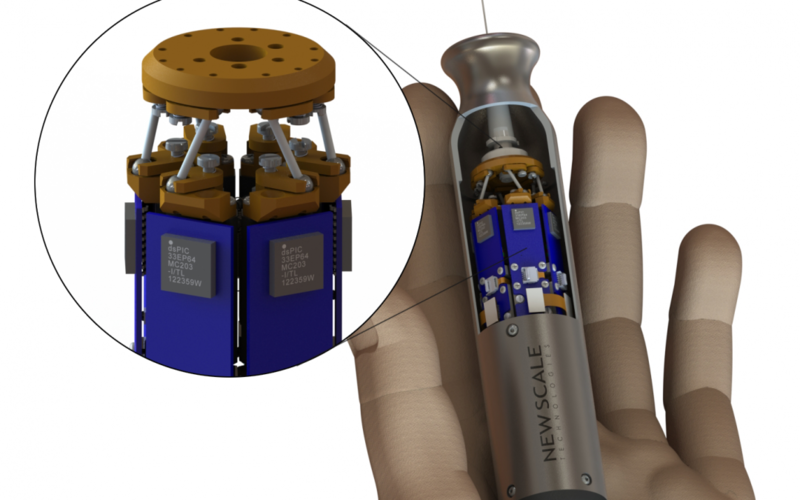 New Scale Technologies has been awarded an SBIR grant from NIH to develop a miniature commercial hexapod, a tiny six-degree-of-freedom micromanipulator. Victor, NY — April 11, 2016— New Scale Technologies is developing the world’s smallest commercial hexapod under a Phase 1 Small Business Innovative Research (SBIR) grant. Awarded by the National Eye Institute of the National Institutes of Health (NIH), the grant funds development of a clinically-compatible, six-degree-of-freedom (6-DOF) hand-held micromanipulator for hand tremor cancellation in microsurgical systems. A prototype micromanipulator was developed the Robotics Institute at Carnegie Mellon University with New Scale contributions. At less than 25 mm in diameter, it was the first hexapod or Gough-Stewart platform small enough for use in a hand-held instrument. New Scale is using the SBIR grant to develop an improved hexapod system with the same small size as the prototype, preparing the way for a clinically-compatible product ready for commercialization. Specific aims include improved dynamic performance, higher precision, and integration of a microcontroller with local feedback and motion control. Additionally, New Scale will evaluate the feasibility of a future wireless instrument with MEMS inertial sensors, on-board batteries and wireless communication. The hexapod system incorporates six piezoelectric SQUIGGLE® micro motors, miniature bearing assemblies, motor mounts, flexures, spring preloads and miniature drive electronics. In the handheld surgical tool, CMU algorithms enable the hexapod system to track its own motion, filter the undesired motion component, and deflect the tool tip with equal and opposite motion to reduce tremor amplitude. The CMU research was published in IEEE/ASME Transactions on Mechatronics, Volume 20, Issue 2, by Yang, MacLachlan and Riviere. With its unprecedented small size and submicron precision, a commercialized version of the miniature hexapod has utility beyond microsurgery. Applications include use as a robotic end-effector for testing and manufacture of MEMS and photonics accessories, and positioning and alignment of collimated fibers or assemblies. The micro hexapod positioner builds on New Scale’s M3 “micro-mechatronic module” development platform, enabling the smallest, highest resolution, most repeatable closed-loop positioning solutions available. Each M3 smart module integrates New Scale’s patented and proprietary SQUIGGLE® or UTAF™ piezoelectric motors, drive electronics, position sensors, micro mechanical guides and control technologies. These “all in-one” smart modules plug-and-play directly with an embedded processor and provide the fastest time to market with the lowest total cost. Research reported in this document was supported by the National Eye Institute of the National Institutes of Health under Award Number R43EY026304. The content is solely the responsibility of the authors and does not necessarily represent the official views of the National Institutes of Health.